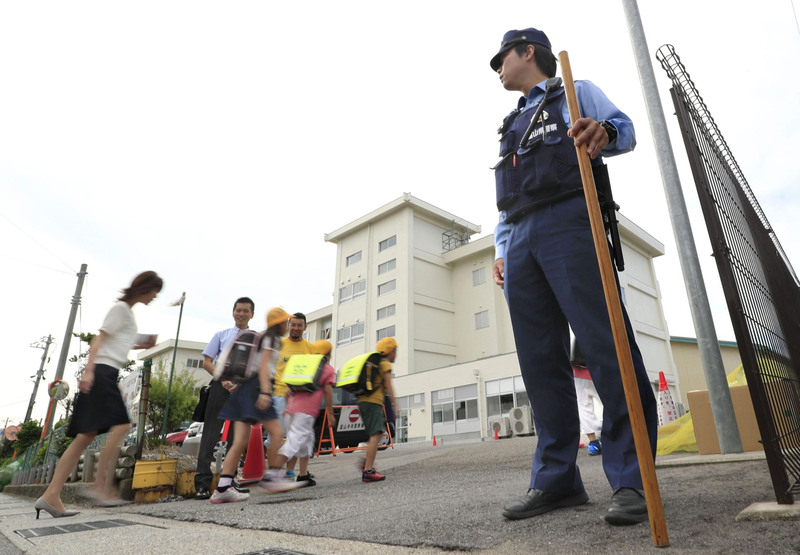 TOYAMA - Classes resumed at an elementary school in the city of Toyama on Tuesday amid tight security, a week after a man killed a security guard who worked at the school and a police officer, with a knife and a gun, as well as firing bullets at the school. Pupils were accompanied by family members as they went to Okuda Elementary School after authorities requested that they be escorted, while teachers stood at nearby intersections and police officers patrolled the area. “I am worried my son might have a flashback of the incident,” said a 45-year-old woman, who walked her second-grader to school. “I am also worried about threatening emails,” the mother said, referring to messages sent to local police and a major daily newspaper suggesting that the school could be the target of a new attack. The threats delayed the school’s reopening, which had originally been scheduled for Monday. Two police officers will be present at the school compound at least through Wednesday to ensure safety. Before reopening classes the school had taken steps to reduce potential sources of psychological stress for the pupils following the attack, such as changing the designated walking routes to the school. Previous routes took pupils past the police box and through the front gates of the school where the murders took place. The school has also stopped using the corridor where one of the bullets used in the attack was found. Classes in the rooms along the corridor were moved elsewhere, and a counselor has been dispatched to provide pupils with psychological support. The school, where two bullets were recovered after the incident, had been closed since last Tuesday, when a 21-year-old former Self-Defense Forces member stabbed a policeman to death at a nearby police box and stole his handgun before fatally shooting a security guard near the school’s front gate. Keita Shimazu, now hospitalized, was arrested at the scene after being shot by a police officer. 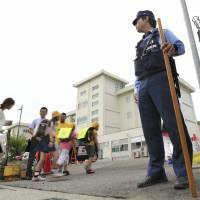 Local police and Asahi Shimbun Co., publisher of the major daily newspaper, each received an email Sunday night threatening an attack at the school. The police said the two emails were sent around the same time and appeared to be from the same person. They are investigating the threats as a case of intimidation or forcible obstruction of business.